Training brought to you at the time and place of your choice! 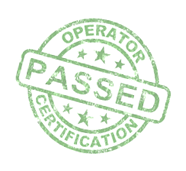 Our Certification Overview is offered for Classes I, II, III or IV for Wastewater and Classes A, B, C or D for Water. Payment for this training is due in advance, and members receive a discount. You may either pay here by credit card, or print out the brochure and mail in the registration form by check. When payment is recieved in our office, we will mail the binder to you and let the person in your area know to call you to set up your training.